"This idea of no racial profiling, I've seen the video and it looks to me like you don't need to bother with that particular factor because they all appear to be of a single origin, I should say, continental origin, might be the way to phrase that," he said in response to a question regarding calls from the Congressional Black Caucus for a Justice Department investigation into police conduct toward the protesters. 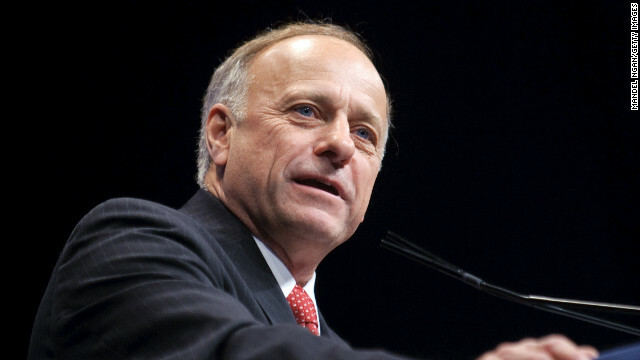 "I just reject race-based politics, identity politics," King said. "We're all God's children. We all should be held to the same standards and the same level of behavior." King has generated controversy previously for controversial comments on other issues, like immigration. CNN sought a comment from his office, but hasn’t received a response. Further evidence that the GOP is all in on changing the wording of their message while leaving the content of the message alone. Suffice it to say my friend that had a young Black man, or not so young, put his hands on a police officer I can almost guarantee you that he would have been made to suffer, physically, the consequences. And I don't mean AFTER being taken to the precint either. I am here to tell you my dear friend as a Dominican woman, mother of two men of color, that the treatment that your young white man got is not necessarily the treatment afforded to men, young or old, of color by policemen in our country. Mothers of color who have boys are known to have "the conversation" with their son/s as to how they should act when approached by a policeman or if ever they are pulled over. LMAO does he not realize almost all of us are from a different continental origin? The only ones who come from this continent are the native Americans. Ahhhh – now THAT'S the good ol' GOP that all know, but only some love. "Continental origin?" Another person from the far right, expressing their outright hostility for anyone that is not exactly like them. To Steve (above) on your comments on blacks committing the majority of murders? Majority of victims are also black, and it's dangerous of you to throw statistics around w/o putting them into some context. Your pulling up this statistic is your response to another unarmed kid getting shot? Why don't you go play in traffic! White people have grown tired of being called racist for 6 years after many help get him elected and it has only grew worse after the second election . Had you bothered to educate yourself in your youth you would not have to worry about it. As it is there is a strong correlation between level of schooling (and your writing (dis)ability suggests that your competency is fairly low. In my 38 years on this earth I have not once been called a racist. I have in fact been held up as an example of a fine human being by people of a number of races. If you are being called out as a racist maybe it is time for some introspection? Sounds to me like you have a you problem. He was shot several times Lynda. ". Four officers where standing near one of the cars along with a young white man who had his hands handcuffed behind his back..."
Therein lies the difference Lynda. All folks in Ferguson and mothers like me are asking is that our young Black men be treated in the same manner by police officers as that young white man. I used that as an example of how ALL law enforcement should treat "suspects" and not as a method to infringe on the total injustice of what happened in Ferguson. Indeed. I wanted to bring clarity to the injustice of what DID happen in Ferguson. Perhaps I am still being naive in offering what should have happened in Ferguson as an anecdote for what did happen in hope that one day this WILL NOT happen as "normal" in America? Are the libtards in here actually denying that it is always the blacks in this country that riot, loot and burn down their own cities? Geez, it is just like you clowns denying that 99.99% of terrorists are muslims. GET REAL!! No, the militarization of local police forces began in the 80's, particularly with handing them surplus military equipment. It bred a certain mentality and has been very determinative in forming the character of their conduct of law enforcement. It was this militarization and self-righteousness and "warzone" mentality that bred cops who would do what this one did, causing neighborhoods who have had enough to riot. I don't excuse the rioting whatsoever, but I also have no tolerance for seeing pictures of camo'd goon squads of pseudo-soldiers pretending peaceful streets and McDonalds' are akin to a middle east warzone and using it to justify pointing assault rifles at innocent bystanders or roughing up journalists as a bit of mid-afternoon ego massage. Go watch the video of the journalists in McDonalds getting told to stop videotaping and evacuate McDonalds while there was absolutely nothing untoward going on outside in the middle of the sunshiney day...then tell me I'm not right about their mental state as a result of getting to play dress-up like the big boys who went to Iraq or Afghanistan. That mentality and perception of their own authority is inflated and driven by the militaristic gear, the need to use it, the culture that it breeds within the police force. Johnnie, I take it that your city has never won a major sports championship, right?